Liberty Danes is named after the stables I started many years before I started breeding Danes: Liberty Run Stables. 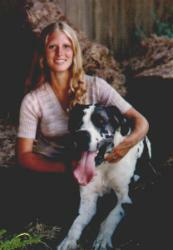 During my many years, past and present, training and raising Appaloosa Sport Horses for dressage and eventing, I always had a Dane at my side. Zac, a stray that followed me home, was my first. He went on many trail rides and enjoyed many truck rides before I lost him. He sparked my interest in the breed, and started me down the road on which I now find myself. 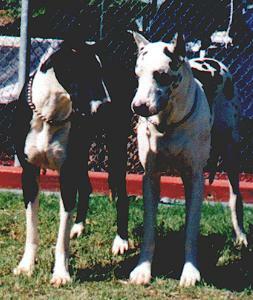 I will admit when I started breeding Danes that I had my share of disappointments. I learned many things the hard way. Although I may have acquired my education through the school of hard knocks, without the benefit of a mentor, I have amassed a great deal of information that I am happy to pass on to others wishing to become involved in the wonderful world of Great Danes. I also willingly admit that I have a lot to learn, and so am fortunate to be a part of a list of mentors. 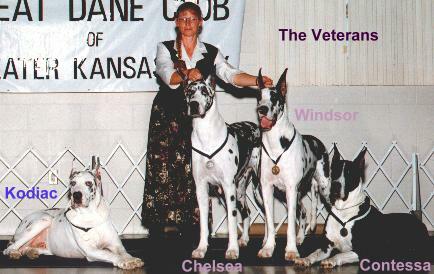 I currently show Danes in obedience, agility, tracking, and conformation and do therapy work. I hope to be doing some freestyle obedience in the near future. My training methods come from several different backgrounds, including my horses. Kodiac, one of my obedience and therapy Danes, has brought me much joy through our accomplishments. He achieved his CD without any difficulty, and went on to win the graduate novice class at the 1994 GDCA National Specialty, and the 1998 GDCA National Specialty. 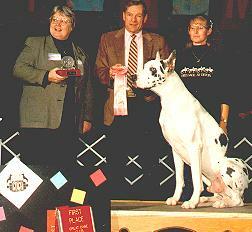 He also competed in brace obedience with is mantle daughter and showed his enjoyment each time he went in the ring. 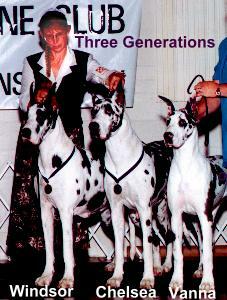 I currently live with three generations of my Danes. This includes four veterans. 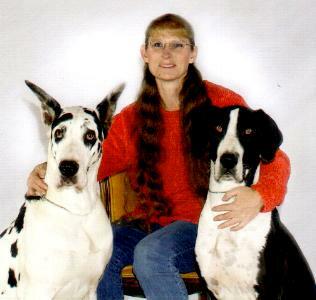 My danes have titles ranging from CGC's,(Canine Good Citizen), CD's, (Companion Dog), CDX's,(Companion Dog Excellent), NA's, OA's,(Novice and Open Standard Agility), NAJ's, OAJ's, AXJ's(Novice,Open and Excellent Jumpers Agility), RN's, (Rally Novice), TD's, (Tracking Dog), TT's, (American Temperament Test), TDI's, (Therapy Dog International) and Int.Ch., (International Champion). I hope to add several American champions to those titles in the near future. I still raise and train Appaloosa Sport Horses, and enjoy much success in eventing and dressage, but my world has become wrapped around my Danes for the last several years. As I continue to improve my training techniques, and my knowledge about health, nutrition, and genetics I feel sure that my Danes will continue to benefit from the effort.